Want a sneaky peak at a bunch of new skins for Fortnite Season 4? Of course you do. Fortnite Season 4 has just gone live and with it seven new Battle Pass skins. They’re pretty groovy. But that’s not all the skins you’re going to get during the ten week season. Datamining by TwoEpicBuddies of today’s Season 4 patch has revealed another seven new faces that you can expect to see roll out over the coming weeks. This piece of art mixes up the new and leaked skins, but let’s have a look at them from top left to bottom right. Top left we have a fairly standard looking Fortnite character (although does the furry collar hint at a fan-requested changeable weather system to come?). Next to him we have some dude in a terrible rave outfit. And to the right of Season 4’s Battlehawk we see the female variation on that rave gear. Nasty. The second row features male and female metallic character skins, similar to X-Men’s Colossus. Next to those is the male version of graffiti artist Teknique who unlocks at Tier 23 of the Battle Pass. The third row down are all from the Season 4 Battle Pass – Joey, Valor, Squad Leader and Tier 100 unlock Omega. 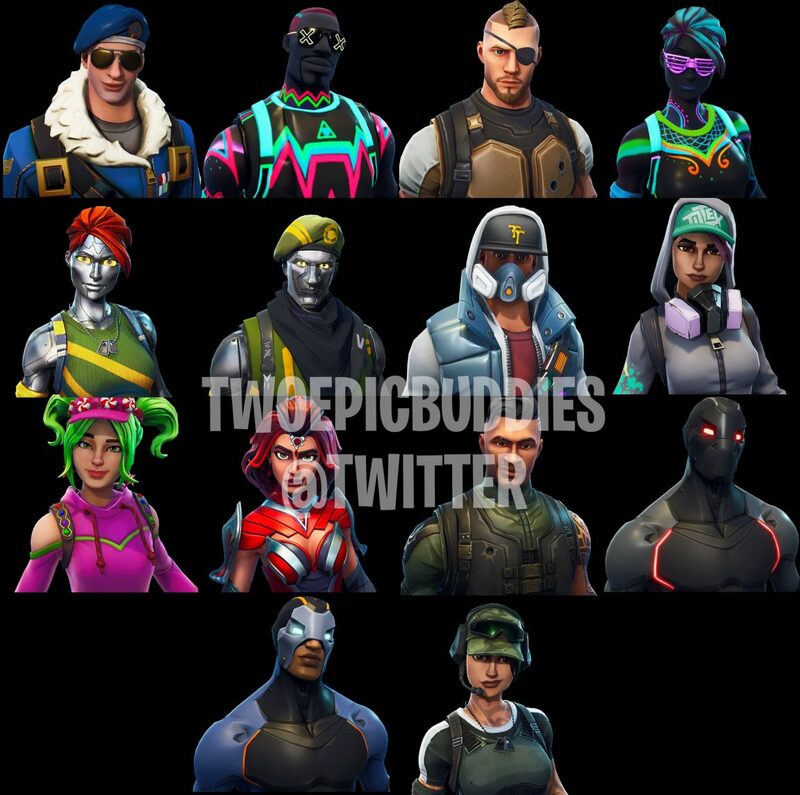 The bottom row features Carbide and what looks to be a female version of military guy Squad Leader. That’s not all. 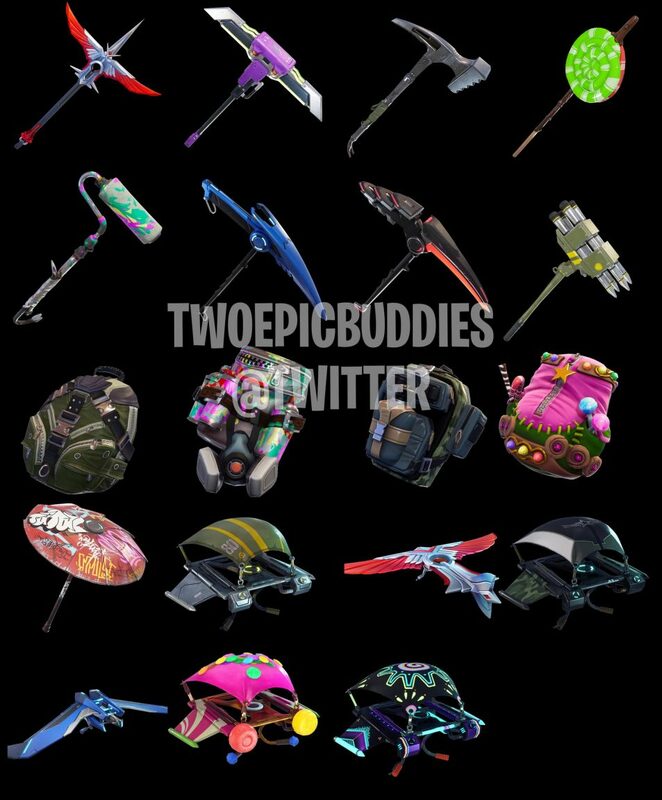 More datamining has also revealed a bunch of backpack bling and pickaxes, and again, this artwork shows Season 4 unlocks and stuff that is yet to be officially revealed by Epic. If you’re just getting stuck into Fortnite Season 4, we’ve got a guide to all Week 1 Challenges including where to follow the treasure map found in Tomato Town.